I grew up watching movies starring the great Bill Murray. Ghostbusters, Little Shop of Horrors, Scrooged were some of my favorites as a child and then I was introduced to old episodes of Saturday Night Live from the 70's and found a whole new appreciation for this comedian. I've never seen Caddyshack or Groundhog Day, which are probably the roles he's most famous for. When I mentioned this to my husband and suggested that maybe we watch them, his face lit up like I gave him a Christmas present. So, I must be missing out on something. I didn't know much about the actor before reading The Big Bad Book of Bill Murray by Robert Schnakenberg, and when I flipped through the pages, it wasn't quite what I expected out of a biography. In fact, I'm reluctant to even call it a biography, it's more of an encyclopedia filled with facts about the actor. If you want to know Murray's view of cats, well you can find it listed under C. How does he feel about golf? Look under G, and spoiler alert: He loves it. Everything you never knew you wanted to know seems to be in this book. My particular favorites is the roles he was considered for and didn't want and Tales From Murrayland. Robert Schnakenberg hasn't met or conducted interviews with Murray, so all this information is collected through books, television, newspaper, and magazines interviews with Murray as well as his colleagues. However, it is nice to have it all compacted into one book. 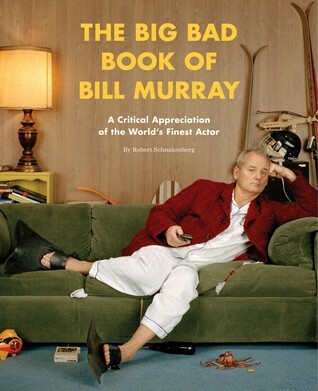 The Big Bad Book of Bill Murray is a great homage to this beloved comedian. I had a paperback copy of this book, but I also listened to it as an audio book as well. And while I'm a fan of audio books, I think I would pass on it in this case. Please note: This has absolutely nothing to do with the quality of the audio book or the narrator. Both were excellent. The book has images and is visually stimulating. While listening to the audio is good. but it's as if someone is reading entries to an encyclopedia. Johnny Heller, the narrator, did a wonderful job with the material. I would absolutely listen to another book narrated by Heller. This book didn't work as an audio book for me. If you'd like to listen to a sample of this book, click here.